-Min. 2 night stay retreat facility, no day trips. -Min. group size: 15 people. Maximum group size: 30. 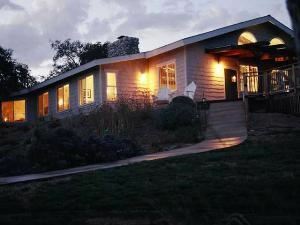 The Lodge at Oak Creek Ranch is a beautiful 6,000 sq. ft. facility, which includes a striking main room for group gatherings, which features a large stone fireplace, gourmet kitchen, dining facilities, and first-class accommodations for up to 25 guests. The 11 “bed and breakfast” theme bedrooms and 8 bathrooms make it a perfect location for corporate retreats or large family gatherings. Atmosphere/Decor: The Lodge at Oak Creek Ranch is a beautiful 6,000 sq. ft. facility, which accommodations for up to 25 guests. The 11 “bed and breakfast” theme bedrooms and 8 bathrooms make it a perfect location for corporate retreats or large family gatherings. Special Features: Includes a striking main room for group gatherings, which features a large stone fireplace, gourmet kitchen, dining facilities etc.